‘Modest clothing’ receives 8,000 Google searches each month in the US. And religion isn’t the only reason women are opting to cover up. For some, it’s a personal preference; they find modesty empowering. With the #MeToo movement, women are dressing for themselves than for the male gaze. While the majority of customers are based in the Middle East, demand is growing in the US and UK. We’ve studied how modest fashion trends have evolved, as well as what opportunities brands can tap into. The Sunday Times reported a distinct shift in traditional dress in Saudi Arabia. New designers are pushing boundaries by introducing color and patterns to traditional garments, a bold move in contrast to standard black. Our color analysis software shows how color has evolved in this market. Let’s start with analyzing new abayas (long traditional robes) arriving at Namshi and Noon (two of the largest UAE retailers) over the past three months compared to a year ago. While black still dominates, playful colors like red and pink are increasing. Over the past three months, black made up 59% of the new abayas arriving at these retailers. When compared to the same period a year ago (2017-18), black was 74%. The abayas color wheels reveal an obvious swing into brighter colors and less grey. This confirms bolder tones are becoming more acceptable within this market. There is a similar trend in prints, which are rapidly gaining popularity. In the past month, patterned abayas in the UAE have increased by 70% compared to the month prior. There’s more growth in another area, too. Jewelry has seen a 37% uptick over the past three months compared to the three months prior. This is a powerful category, especially for younger consumers who wear accessories as a statement. Jewelry is an easy way for brands to gain footing in the UAE market. Rings have seen a 347% increase followed by bracelets 136%, necklaces 5% and earrings 4%. Modest dressing has been gaining momentum for some time. 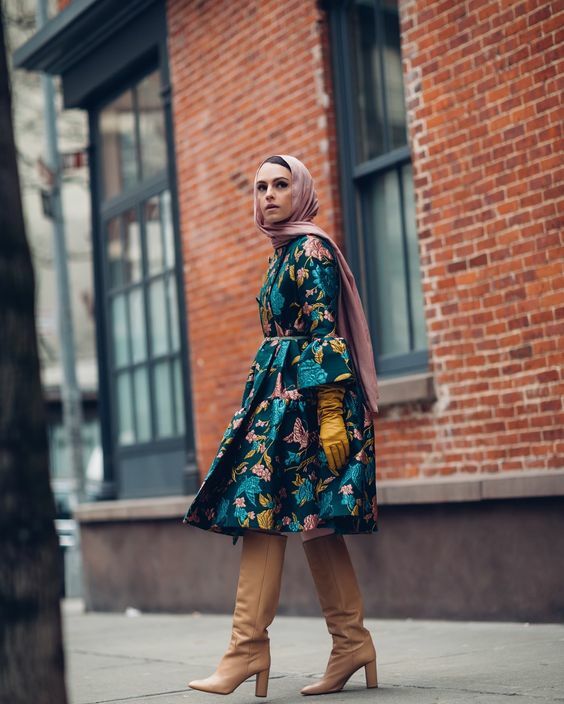 In 2017 new modest products arriving in the US included long sleeved dresses, high necklines, midi dresses, and maxi skirts. We’ve charted steady demand for these items throughout the year followed by a spike in October. This coincides with the #MeToo movement going viral, showing how fashion reflects global trends. Modest fashion is a serious game and it’s not slowing, there’s been a 15% increase since 2017. So who’s wearing modestly? Western women in the US make up 36% of customers shopping on The Modist, a ecommerce platform for luxury modest fashion. The retailer showcases pieces from luxury brands alongside up-and-coming middle eastern designers. How is retail interpreting modesty? The luxury market is pioneering the modest fashion movement. Dolce & Gabbana launched a range of hijabs and abayas back in 2016. Since Alessandro Michele joined the helm at Gucci, more feminine and elegant pieces started to trickle through. This evolution is obvious in Gucci’s recent marketing, a stark contrast to their campaigns from the early noughties (‘G’ pubic hair anyone?). Meanwhile, Kenzo and Burberry’s Spring 2019 campaigns featured long silhouettes, chaste necklines, and headscarves. Over the past year, modest styles have shifted in both the luxury and mass market. In the US luxury market, there was a 50% increase YoY of long sleeve blouses with a high neckline. Compared to the mass market, this style experienced a 13% decline in the US but a 15% increase in the UK. Growth in the UK was driven by brands such as Zara, Vero Moda, and River Island. In the luxury market, hemlines start to come down. The midi is the key shape, making up 53% of the total skirt assortment. Designers buying into this style include Gucci, Marni, Tibi, and Jil Sander. While the maxi skirt makes up the smallest percentage in both markets, this silhouette has grown 55% in the mass market YoY and 67% in luxury. Modest active and swimwear still stand out as an untapped opportunity for Western retailers. It’s been over a year since Nike launched their Pro Hijab with next to no competition from other pure-play active brands. Slazenger and Marks & Spencer have dabbled in a small range of burkinis. EDITED Users: Expanding your modest fashion assortment? Log in to read our full product review here. Analyzing the latest runway shows, modest elements were prevalent in all cities. Jil Sander, Etro and Dior showcased covered dresses and layering emerged as one of the strongest trends of the season. High necklines were among the key shapes for tops alongside blouses featuring long sleeves and a feminine bow tie. For commercial silhouettes, knife and box pleats give a workwear feel to midi and maxi skirts. Outside the shows, we saw headscarves on Milan fashion week attendees, giving the accessory the street style seal of approval. EDITED users: log in here to see our entire Fall 2019 coverage. Seeing these looks on the catwalk confirms the continued presence of modest dressing. While this market has seen growth, there’s still an open space for specialist categories. Muslim spending on fashion is predicted to reach £286 billion by 2021 so the time tap into this market is now. Research and data by Kayla Marci, Market Analyst.